This is our standard multipurpose pad. 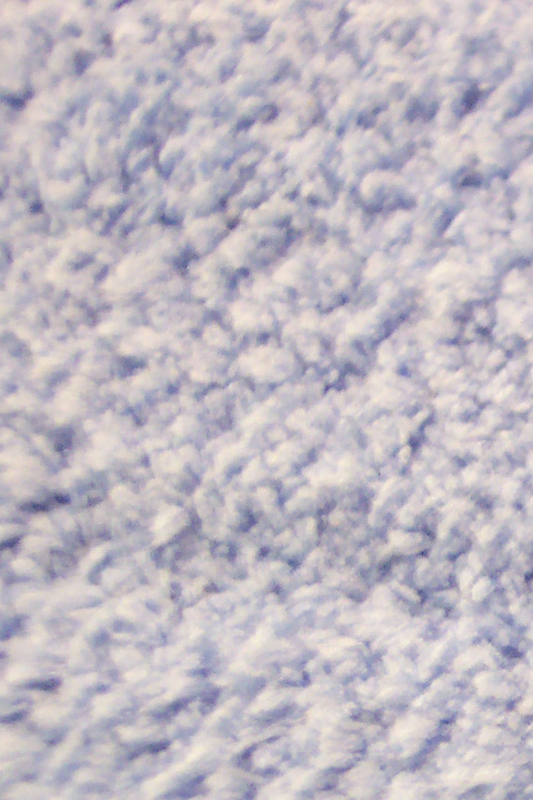 It can be used wet or dry to clean any type of hard flooring, and it features a thick, spongy inner core with fluffy terry microfiber on the face. It's great for all around cleaning, and can be used safely on any type of floor. You will find that it is fairly absorbent, but it also produces superior results when used dry. It's great for hardwoods, linoleum, tile and more. We also have a Polishing Pad that is made from a similar material, but it's combined with another fiber that improves your ability to shine surfaces as you mop. The two pads are similar in many ways, but each has advantages over the other. Some customers prefer one over the other, while many like to have both on hand. They are designed for use with the 18" mops that we sell, but can be attached to many other tools that are the same size. They measure 18" x 5" and are totally washable for hundreds of uses. Use dry for dusting, sweeping and polishing, or get it wet for mopping and deep cleaning. Superior Quality. Top of the line microfiber is used to construct theses, so they outperform and outlast most others. Why guess with other similar products when you can guarantee results with ours? Compatible. Designed to fit perfectly on the tools we sell, but also compatible with other brands too. If your mop head is a similar size, and has a similar connection method, it will work for you. Washable. Use over and over again without any increase in cost, or decrease in performance. They are totally machine washable, and will last for hundreds of cleanings. Versatile. Use wet or dry. When damp they can deep clean without chemicals, and when dry, they can dust mop and polish. Use on any floor safely, but also use for walls, windows, mirrors and sky lights. Non-Toxic. Skip the pine scents, and stop guessing at what is coating that disposable pad. These will clean better and they do it without any risk to people or the environment. Disposable version never clean as well, they cost way more, and they almost always rely on some sort of chemical cleaning agent to get the job done. To forget about last minute trips to the store when refills run out, and avoid creating trash unnecessarily, switch to this reusable alternative. Save money and make your floors look better when you choose these powerful pads. They are washable, so there are never any replacement supplies to buy, and they can be laundered hundreds of times before they need to be replaced. After a light mopping, just rinse the pad in warm water and then store it on the mop for later use. When it becomes completely soiled, put the pad in your washing machine for cleaning. Please Note: Never use bleach or fabric softener when washing these. Bleach will deteriorate the fibers and fabric softener will clogs them. With prolonged exposure, they will no longer work as well. Not magical or soaked with chemicals, it is the superior microfiber material that makes them work so well. They are made from a combination of polymers that are extremely small, and designed for cleaning. This material is carefully woven into masses of fabric with incredible surface area, and each microscopic fiber is lined with minuscule hooks and loops. The wedge-shaped edges of these millions of hooks & loops cut through stains, attract dirt, and lock everything in for alter disposal. They actually lift up dirt off the floor and then store it within the fibers, and this results in quick and easy mopping. Each individual strand is one hundred times thinner than a human hair, so there are literally tens of thousands of strands in every square inch of fabric. These are not treated with any chemicals, and you don't need to use any when you mop with them. The material so good, that all you need is water to clean 98-99% of all dirt, dust, hair and germs from your floors. The fiber's wedge shaped filaments follow surfaces, lift up dirt, and trap the particles inside the fibers. This eliminates the need for harmful cleansers and toxic chemicals. 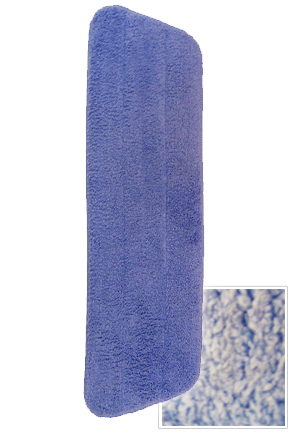 The capillary effect between the filaments and nylon core creates a high absorbency, which in turn enables these pads to clean and polish at the same time. Only water is needed as a detergent to clean any type of surface. Don't pay more for brands that aren't any better, and don't throw away cash on lower quality versions that won't work as well. Ours are tested for performance, and guaranteed to work like we say they do. Shape Trapezoid - Short side: 15" & Long side: 18"
18" Multipurpose Microfiber Mop Pad - Multipurpose mop pads for your microfiber mop. Use these pads wet or dry to clean all types of floors. I was slightly disappointed in the pile of the replacement mop pad, others I have purchased were fluffy material. I kept it rather than return it but would not in the future purchase that item. It is serviceable though. Great product. Just what I wanted in a product. I've used these mop heads for a number of years and find them second yo none. awesome! slightly larger then the head of the floor cleaner but it cleans beautifully! This is one of the greatest products I have ever used. My last pad wore out and I was so happy when I found a replacement. I have had this mop for probably 8 years. I like how easy it is to use and cleans well with just water. The pads are washable in the machine. After much use, the velcro gave out. So, I reordered and am very happy with the larger size and package of 2. Very satisfied with the microfiber mop pad. Great quality,works well, reasonable price. do the pads have Velcro strips sewn onto the back area? No. They are meant to stick onto a mop head that has the strips. The backing is made from material that adheres to the strips.